The Museum of Modern Art has a great Senior Program - a combination of gallery talks and art studio adventures. Last time, in conjunction with the Brancusi exhibit, we created sculptures with Paper Clay. 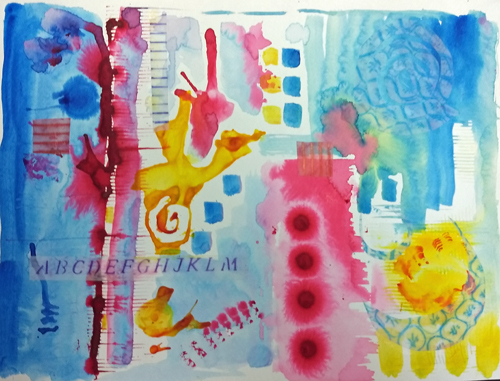 This week we played with liquid watercolor, ink, and vellum to create layered images to explore color. We looked at layered paintings by artists hanging in the museum, and then, with supplies provided for us, played with many types of mark making tools on watercolor paper. We also used various dry media to create designs on vellum, which I cut up and collaged on the watercolor. 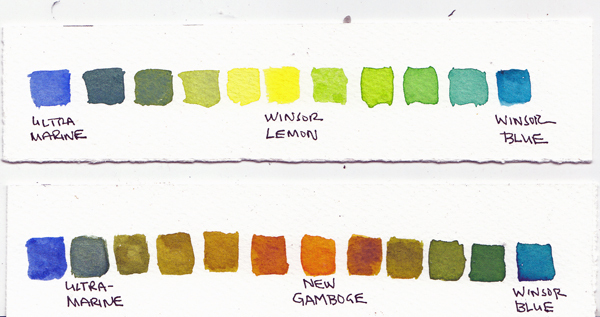 I bought tubes of Winsor Newton Artist Grade Gouache in September 2012 - and squeezed out paint into a new palette. I quickly learned that they flaked, and came out of the wells easily when they dried making them not portable. This week our Sketchbook Skool artist Jennifer Orkin Lewis ("August Wren"), an illustrator, showed us how she used gouache and watercolor paints interchangeably and together, adding other layers to either a wet or dry layer. 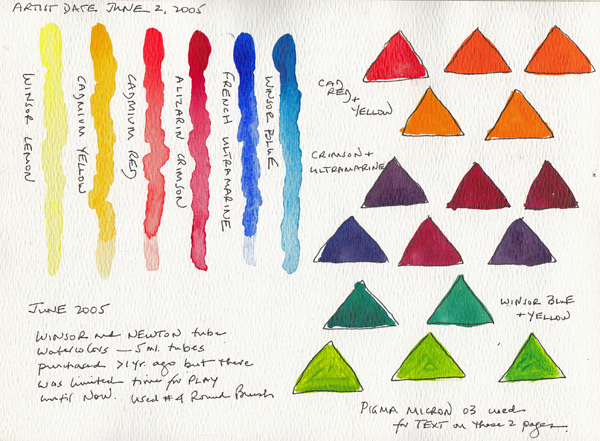 My 2012 tubes of gouache were dried out, but several months ago I bought myself a 12 color set of Pelikan pan gouache. Here are my color mixing studies that I did for homework. 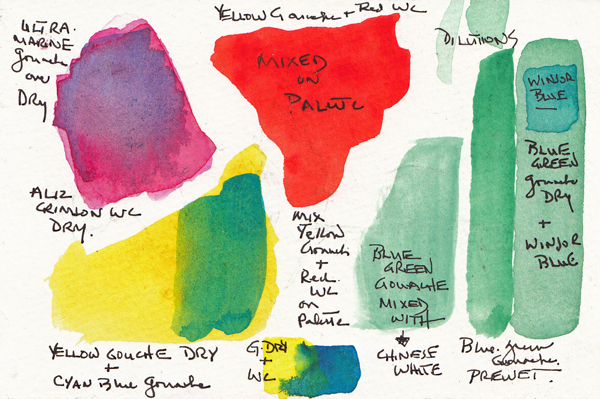 Pelikan Set of 12 Gouache: Samples of the 12 colors on the top left. An opacity test on the bottom left. 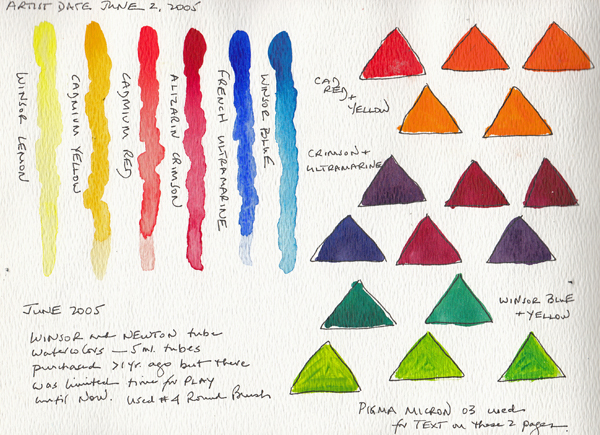 Mixing studies on the right, from top to bottom: 1 and 2: yellow and yellow ochre in the center, with progressive addition of 2 blues; 3 and 4:vermillion red and magenta red in the center with the addition of two blues, and finally 5 and 6: yellow and yellow ochre in the center with the addition of the two reds. 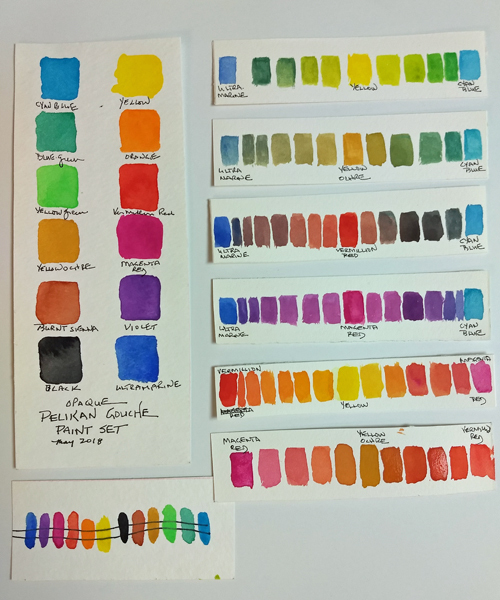 Testing combinations of paints: Watercolor and gouache over samples of dry gouache or watercolor; watercolor and gouache mixed on palette; gouache over dry gouache; and gouache mixed with Chinese white to increase the opacity. I am taking the new Sketchbook Skool class called Watercolor Rules. Ian Sidaway, an amazing watercolor artist from England, was the teacher for the first week, and he was brilliant as he presented everything you always wanted to know about watercolor paints, palettes, brushes, and paper. I started this journey with artist grade watercolors in 2005. 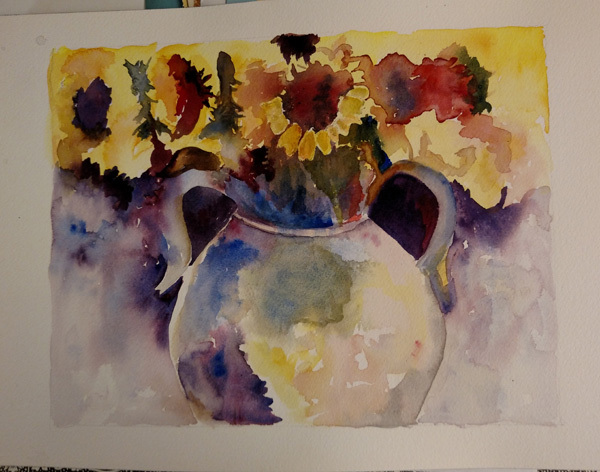 I used a list of two recommended triads of primary colors from a book by Anne Elsworth, and just started playing with them. It was years before I actually took a class in watercolor painting and that fits with my personality. Below is the very first page I did, testing my 6 new small tubes of Winsor Newton paint. Three were listed as cool and three warm. 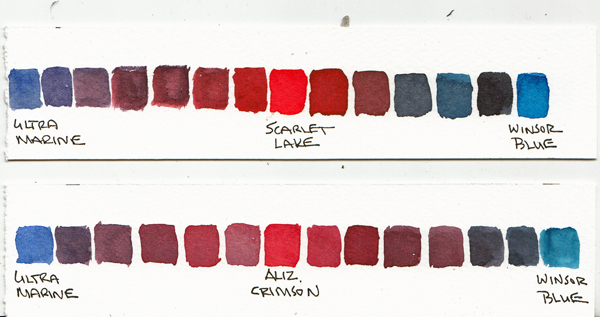 Three years and many sketchbook paintings later, I decided to replace the opaque cadmium paints with almost transparent ones - Scarlet Lake for Cadmium Red and New Gamboge for Cadmium Yellow. 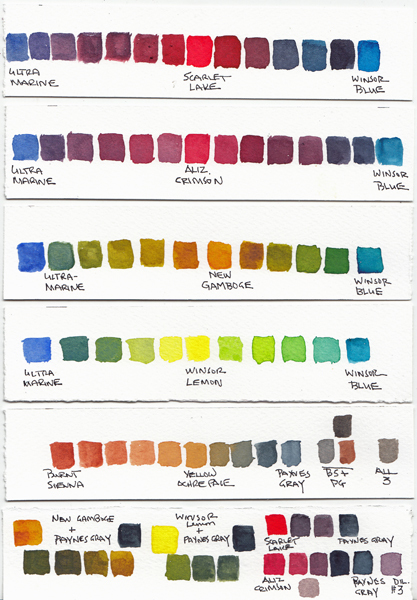 Although you can make grays and browns with the above 6 primary paints, Cathy Johnson, another wonderful watercolor artist, says that she keeps "convenience colors" on her palette, so she doesn't always have to mix them. 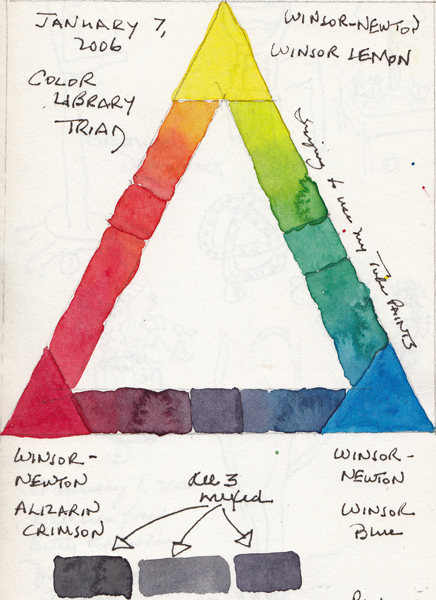 I also read about a different triad of primary colors on Danny Gregory's Everyday Matters Yahoo Group many years ago : the Velasquez triad (also called the "dead triad"). It consists of burnt sienna, yellow ochre, and ultramarine blue. Since I already used ultramarine blue, I replaced it in this triad with Payne's gray which is a beautiful dark blue. Burnt Sienna and Ultramarine Blue also make many different, beautiful grays. This is my 12 color palette that I've used since early 2008 - 3 primary color triads and 3 convenience colors. Ultramarine Blue is considered a warm color and Winsor Blue a cool color, and although I know this intellectually, my eyes never agreed. In answer to a question from our class, Ian Sidaway said to figure it out yourself for your own paints. When you mix all cool colors, or all warm colors, the colors are brighter. Just mix secondary colors - orange, green, and purple - to see if you are mixing two pigments of the same type or mixing a cool with a warm. Since I made many color wheels over the years, tested both the opacity/transparency, and lifting qualities of my paints, I decided to explore Ian's suggestion re: warm-warm, warm-cool, and cool-cool mixtures. Here are my 4 test strips, all done on strips of Fabriano Artistico 140 lb Soft Press, the watercolor paper I bind in my books. One of my yellows, or one of my reds, was painted in the center. I then gradually added my two blues, with Ultramarine Blue to the left and Winsor Blue to the right. I like mixing colors, and always just mix them on my palette to get the colors I want for a painting. This won't change my methods, but it is fun to see the many colors I can make. 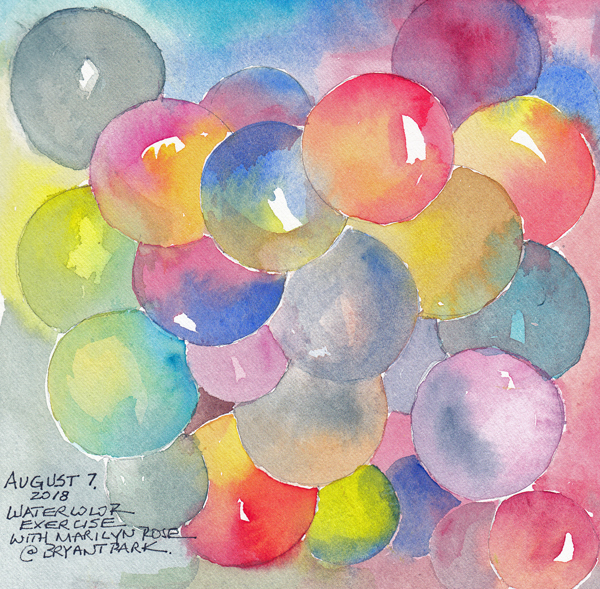 In August, an acquaintance of mine, watercolor artist Marilyn Rose, taught a free 2 hour watercolor class at Bryant Park in NYC. I used my own 12 paint palette to create the end of class painting we did to practice color mixing. Mixing watercolor paints is addictive. After doing the strips in the image above, I decided to add my 3rd triad (Yellow Ochre Pale, Burnet Sienna, and Payne's Gray). Then I had one more strip left and mixed my original yellows and reds with Paynes Gray. When I saw the 6 strips together I couldn't resist one photo showing all of the colors I can make with 3 triads of primary colors. I was thrilled to just see that the Cooper-Hewitt Design Museum has a new exhibit on COLOR through mid-January for anyone who lives in, or near NYC - or will be visiting during the holidays. See Link below. Note: Two of the older images already appeared in a blog post in August 2018, reviewing the class with Marilyn Rose.